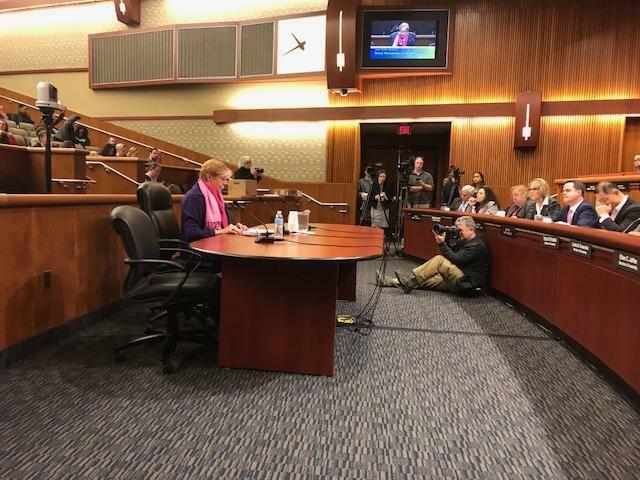 ALBANY, NY (WSKG) – During the first hearing on sexual harassment in New York’s government in 27 years, state lawmakers closely scrutinized Gov. Andrew Cuomo’s policies on the issue, as victims told harrowing stories about their experiences. Survivors of sexual harassment by senators and Assembly members spoke before the hearing, saying they’re relieved there is finally a public forum to talk about improving the state’s anti-sexual harassment laws. Eliyanna Kaiser is a member of the Sexual Harassment Working Group, formed last year by several women who have experienced or reported being victims of sexual harassment by state lawmakers. “Two-hundred-and-sixty-five days after we began pushing for hearings, we’re getting them,” Kaiser said. They are the first hearings in New York state on the matter since 1992. Kaiser worked for former Assemblymember Micah Kellner, who was admonished twice by the Assembly Speaker for sexual harassment and stripped of his committee post. He did not seek re-election in 2014. She and the others criticized the process by which the state’s current sexual harassment prevention laws were drafted, in private, by the governor and three male legislative leaders, one of whom was himself accused of sexual harassment. Former Senate Independent Democratic Conference Leader Jeff Klein is accused of forcibly kissing one of the women in the working group, a charge Klein denies. Klein lost his Senate seat in a primary, and the woman who replaced him, Sen. Alessandra Biaggi, co-chaired the hearing. She said the issue of sexual harassment in the workplace has been kept in the dark for too long. “This will be a place to speak the truth,” Biaggi said. 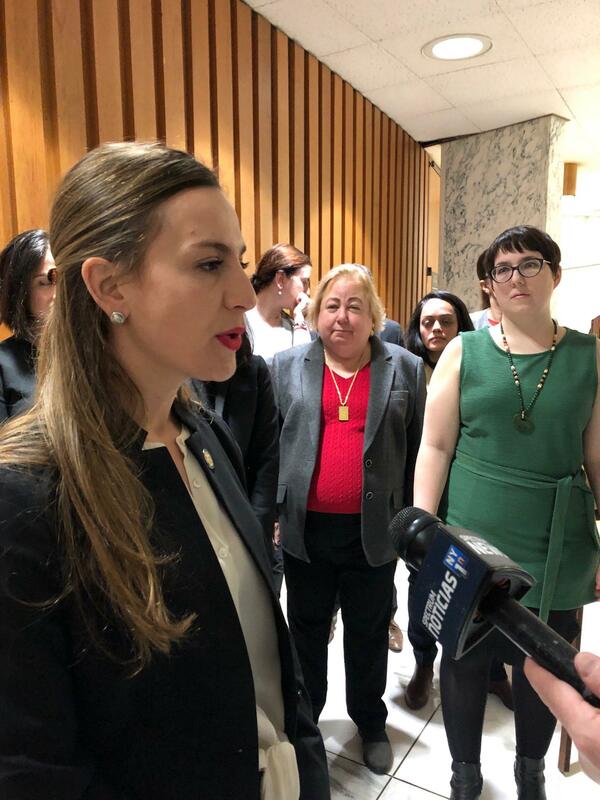 Sen. Alessandra Biaggi speaks before a hearing she chaired on anti-sexual harassment policies. Survivors testified of repeated harassment, including Chloe Rivera and Leah Hebert, who worked for former Assemblyman Vito Lopez. Both feared to speak up against the then-powerful legislator. Hebert said she was traumatized by the experience. Heber said despite repeated conversations with then-Assembly Speaker Sheldon Silver’s office and recorded evidence, the Assembly did not investigate their claims. Hebert eventually signed a non-disclosure agreement, where she would be punished with a $20,000 fine if she ever said anything negative about their former boss. Lopez was later censured and no longer permitted to have interns in his office. He died in 2015. Silver is facing a prison term on unrelated corruption charges. Stunned lawmakers, including Sen. John Liu, assured the women that they were heard. Roberta Reardon, Cuomo’s labor commissioner, testified on the new regulations written by her agency after the agreement between Cuomo and the legislative leaders. She said they are a “game changer” because they require every employer in New York state to have a policy to prevent sexual harassment in their workplace, and every employee must be given that policy and receive yearly interactive training. But questioning from senators and Assembly members revealed significant holes in those policies. Sen. Andrew Gounardes asked Reardon how the agency had sought public comment. No hearings were held. “What was the public comment period on that public input process?” Gounardes asked. “The length of it?” Reardon asked. “I don’t know actually know the length of it,” Reardon said. It was 14 days, Gounardes told her, “during the doldrums of summer” in late August. “I don’t think that’s enough,” Gounardes told her. State Department of Labor Commissioner Roberta Reardon testifies at the hearing Wednesday. Reardon also told lawmakers that while the Department of Labor devised the rules, the agency does not have the power to make sure that the regulations are carried out. Legislators said that is something that needs to be corrected. Reardon told the lawmakers that if they devise new laws to strengthen enforcement or make other changes, her agency would be happy to carry them out. Among changes lawmakers are considering are extending the statute of limitations to file a sexual harassment complaint from one year to three years, and amending the definition of what constitutes harassment so that victims do not have to wait until they are subject to pervasive harassment before they can file a complaint. They’d also like to fix a loophole to make the Assembly and Senate fully accountable when one of their members sexually harasses an employee.